Chemask® Solder Mask protect PC boards, plated thru-holes, contacts, pins, posts, terminals and gold fingers during wave soldering. They provide short-term high-temperature protection from molten solder to 515ºF/268ºC. All solder masks are nonflammable, non-contaminating and will not leave ionic or corrosive residue. 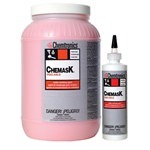 Chemask® Solder Masks are available in convenient squeeze bottles for a precision application or in gallons for automated applications.